Alonzo had completed repairs on most of the homes before we were able to visit. 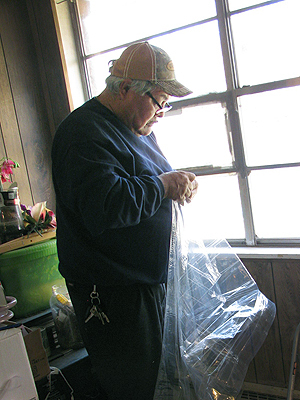 From start to finish, it took over three months — about 110 days — to plan and implement this year’s PWNA Weatherization service through our SWRA program for Elders’ homes. That may seem like a long time, but remember that the people we serve live in remote areas and it can take a full day to weatherize just a few homes due to the distances to travel between houses. The annual process begins in July as our staff discusses potential partners and communities to approach for the service. There are a few different reservations and several communities considered for this special project, but as Program Partners are contacted, the list is narrowed down fairly quickly. This service is time intensive and requires a lot of planning, not only on our part, but also the partner’s. Once the partner is selected, the first order of business is to identify volunteers to install the materials. Volunteers from the community are key to the implementation of this service because it’s important to use individuals with connections to the community and knowledge of where people live to weatherize the homes. These volunteers, with the Program Partners leading the team, help with the repairs on the homes. Our staff delivers the supplies and monitors the progress on the homes. Once Elders are identified, the homes are assessed by conducting a window and door count to ensure an adequate amount of supplies are purchased by PWNA. Alonzo was a volunteer installer for window insulation kits, weather seal tape, and door sweeps. While the partner is assessing, we are working to get the best price for the items needed. This year, a large home department store offered a discount and it kept the material costs to a minimum — approximately $35.00 per home. Once the partner completes the home assessments, a spreadsheet is developed containing the number and size of windows and doors sweeps to be weatherized. These are all tallied and supplies ordered accordingly. The Whiteriver community of the White Mountain Apache tribe in Arizona was selected as the 2016 weatherization site. There are many strong partnerships in this reservation. The Whiteriver Elderly Nutrition Center accepted the weatherization challenge and were able to complete nearly 60 Elders homes by the end of October. There is typically a short window of opportunity to complete the weatherizing service. If we cover the windows too early people won’t to be able to open them on warm fall days. If we do it too late, Elders experience more of the cold and incur extra heating expenses. Installing the plastic is also more challenging once the weather has turned. Typically there are about four prime weeks to complete this project. 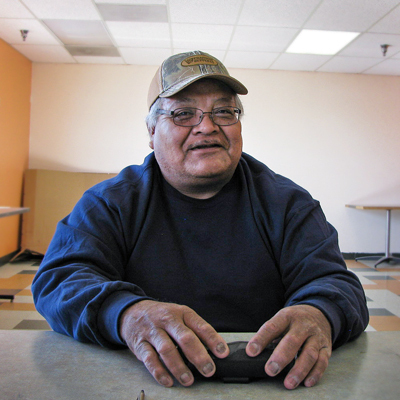 Alonzo, volunteer installer, completed most of the homes prior to our visit in late October. The products used inside window insulation kits included weather seal tape, door sweeps, caulking guns, and caulk. The clear plastic worked very well for most of the Elders. They were informed beforehand that the plastic and seals would be installed on the inside, which gave them time to move items allowing access to the windows. Although some Elders were a little hesitant to have someone in their home, most were satisfied customers and were happy they would still be able to see out the windows and have the sun shining through into their homes. Most of all, the Elders were really happy the cold air was no longer coming in. They liked the clear window film — it made a huge difference, especially when the windows were broken or missing. The process could not be possible without the ongoing support of our generous donors! Thank you for helping to make this service possible!